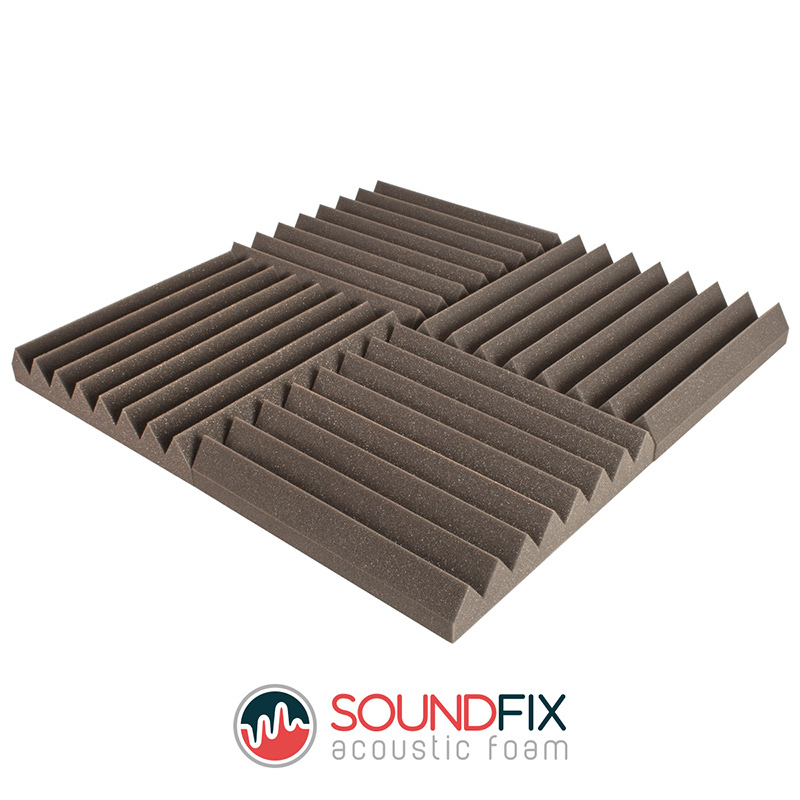 Seize control of unwanted interference with these state-of-the-art acoustic foam tiles from Soundfix, the UK’s leading supplier of acoustic foam to Europe. • Individual tiles measure 300mm x 300mm and are 50mm thick. Each pack includes acoustic tiles which cover an approximate surface area of 1sqft each. • Acoustic foam tiles are suitable for balancing mid to high frequency soundwaves. • NRC rating of 0.85. Our thick 50mm tile has a 20mm base and 30mm rise making them super effective for reducing reverberations and echoes within the room. 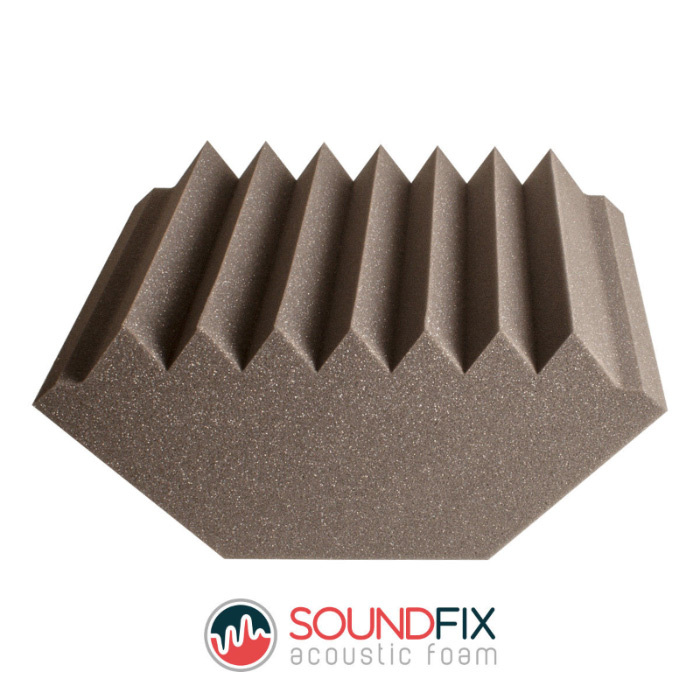 • High performance CNC cut, peak wedge profiled, polyurethane acoustic foam tiles in Studio Grey. Suitable for acoustic sound control within recording studios, rehearsal rooms, DJ booths, video workrooms, home cinemas and more. • Fully fire retardant – UL94 approved. 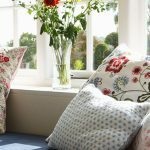 Exceeds the UK requirements for schedule 1, part 1 the Furniture and Furnishings (fire) (safety) Regulations 1988 (amended 1989). • Useful for reducing flutter echoes, standing waves and reflections to improve sound quality. Please note we do not recommend this product for soundproofing purposes. Our state of the art factory in High Wycombe is equipped with the latest CNC cutting technology allowing us to create perfectly accurate acoustic foam tiles again and again at a fraction of the cost of others available on eBay. 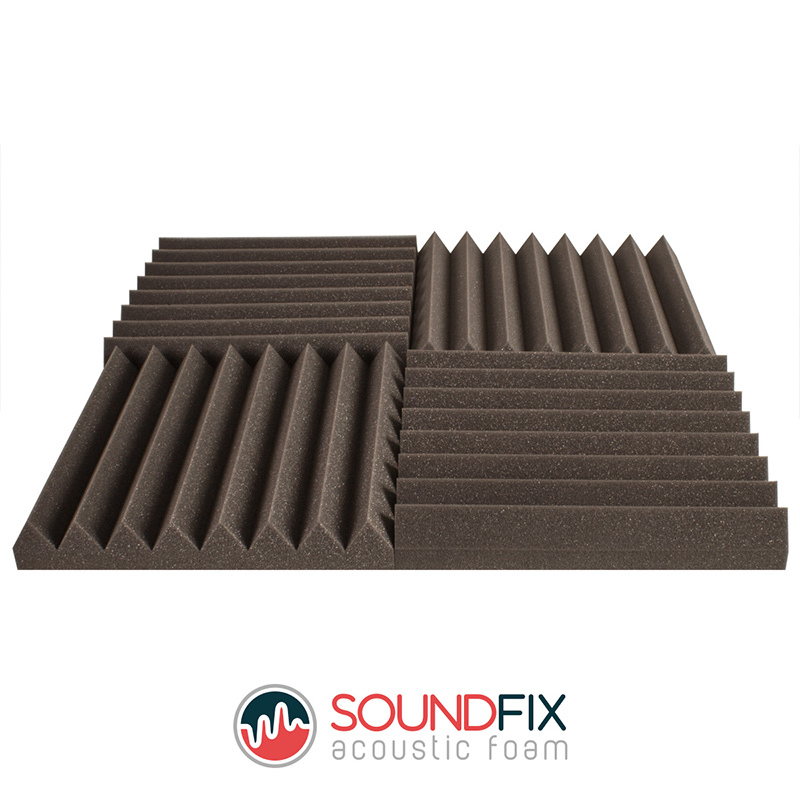 Combined with our premium high density polyether acoustic grade foam and unique profile shapes we offer the best quality soundproofing online. As UK Foam specialists with over 40 years’ experience we know everything there is about the various grades of foam out there. 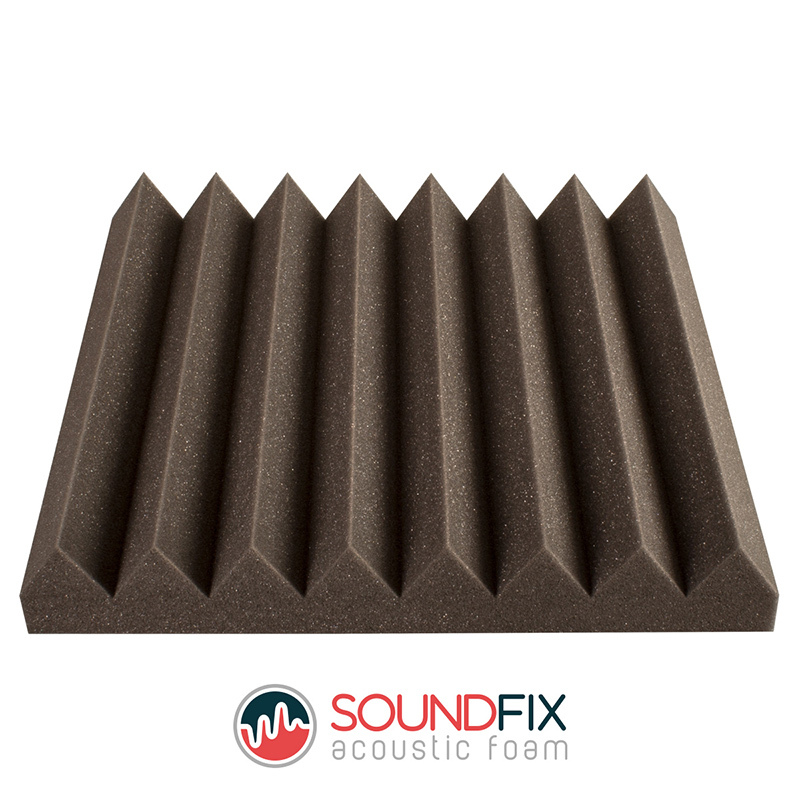 Our specialist acoustic foam tile grade is manufactured specially to achieve the optimum sound absorption across the entire frequency spectrum. These tiles effectively eliminate any high frequency sound wave incident applied on them by creating several deflection surfaces. When the sound waves hit the peaks and valleys of the foam they get deflected in several directions weakening them. 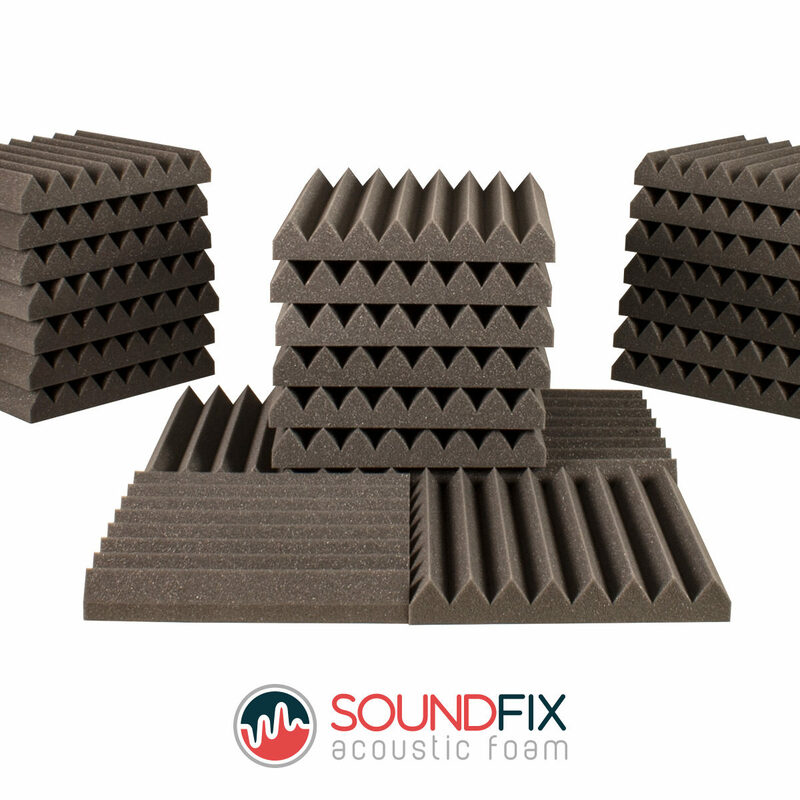 The open cell structure of our specially selected foam grades then absorbs the sounds. Our precise CNC cut valleys are much greater than that of our competitors which helps to trap air within them forming resonant chambers. These chambers broaden the spectrum of absorption in the medium frequency range. For lower frequency absorption, thicker tiles are required. Very low frequencies for example require super thick blocks of foam to completely absorb the sound incident. However, with correct positioning of our tiles you can greatly reduce the lower frequency distortion. 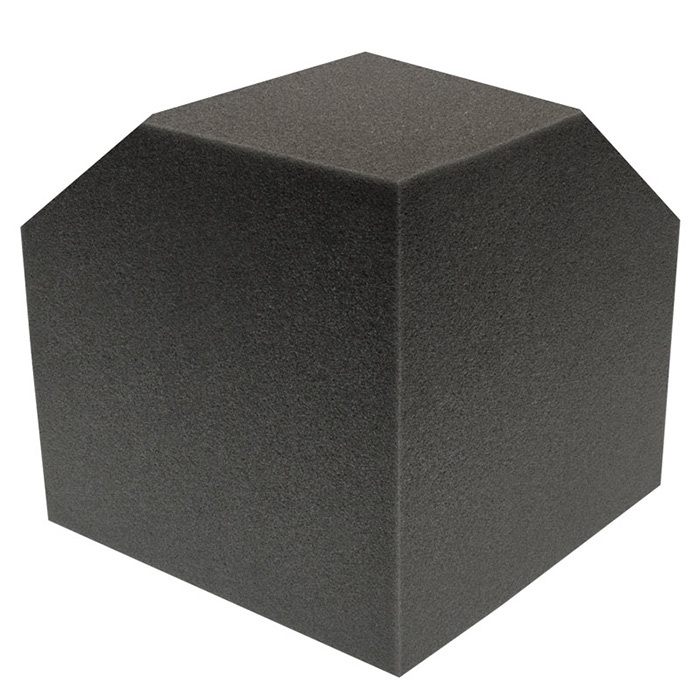 By working directly with us as the manufacturer we are able to offer a better specification acoustic foam tile at the same price point as cheaper products. In simple terms we are able to ‘cut out the middle man’ to provide direct savings to you. Our acoustic wedge tiles conform to stringent fire tests and are suitable for studios, cinema rooms or anywhere acoustic control is required. 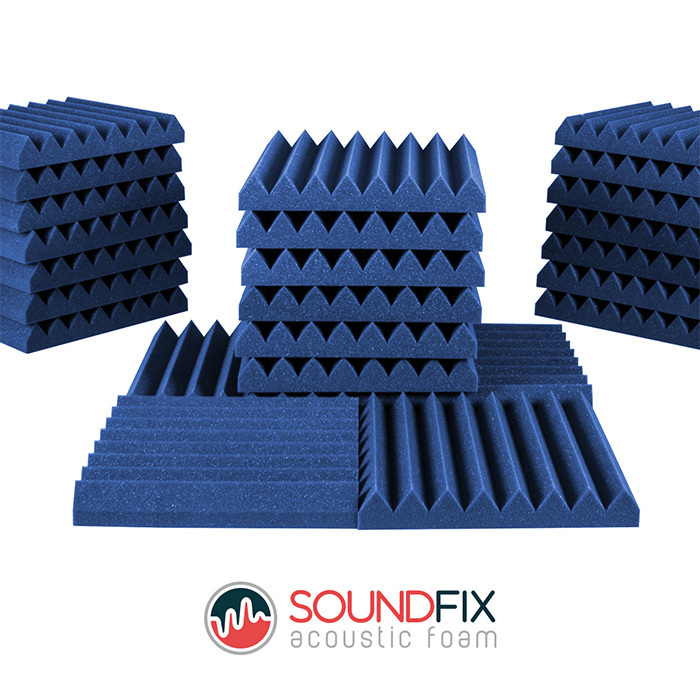 Our acoustic specialist team work to ISO 9001 quality standards to guarantee only the best acoustic foam leaves our foam factory. Excellent tiles very happy with my purchase. No issues with these. Good quality. As soon as you see these you'll realise the quality; best I've come across by far. Fantastic acoustic foam tiles and a good price. After reading the reviews here I thought I'd try the tiles out. Really impressed with them. High quality acoustic foam tiles, recommended. Would buy these again in a flash. 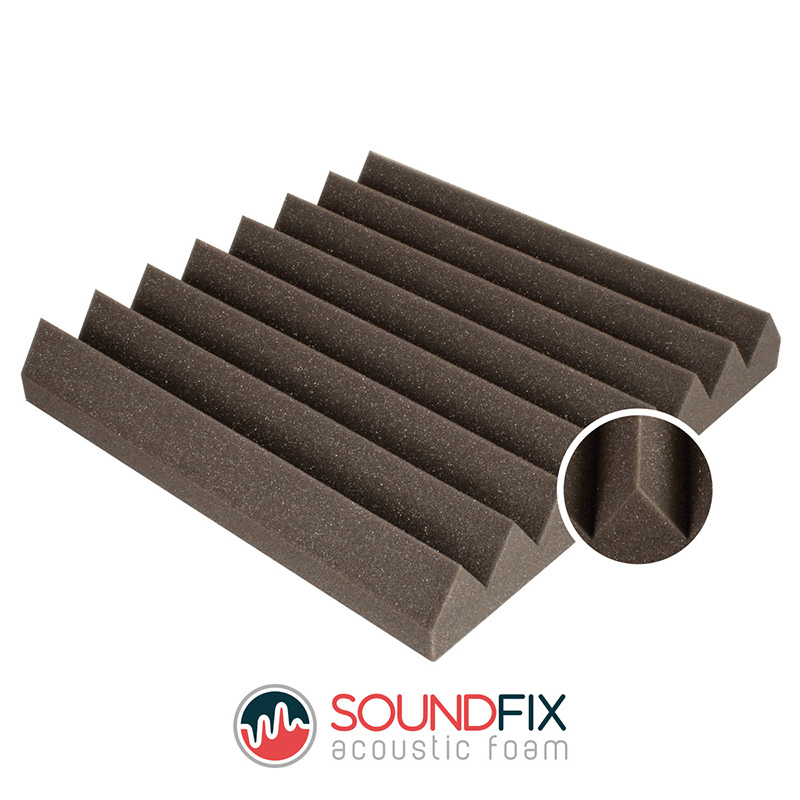 Really great acoustic foam highly recommended. 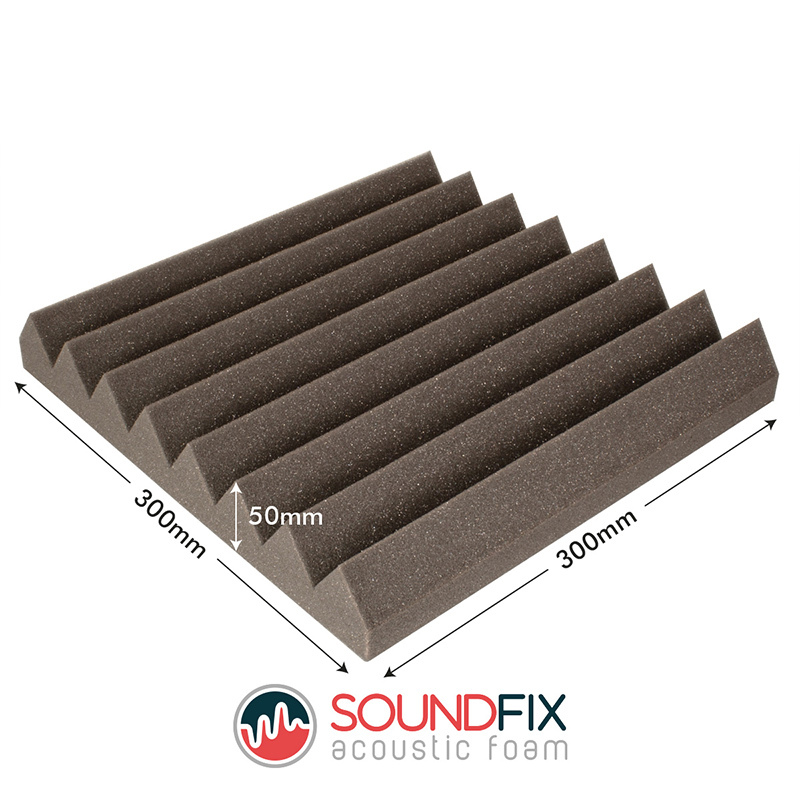 Not heard of this company before but everything went fine and the quality of the acoustic foam is very good. These foam tiles are brilliant! Highly recommended. First time buying acoustic foam and I'm really impressed. Well made acoustic foam tiles would buy these again if needs be. These are really nice tiles, they feel much better than the old ones I had. These were effective than I was expecting. Clearly a good quality product. This is great, I'm getting hardly any sound echo in my studio now. No hassle, smooth transaction, thanks! Great item, thank you! Highly recommend these acoustic foam tiles. Great product will be ordering more ! I always find it amazing how much sound deadening like this works, even just a few tiles on a wall makes a big difference, had to go all the way though using the guides, my cinema room is just so good now. Really happy with these acoustic tiles they look good and get the job done. Really happy with my new acoustic foam thanks. Great acoustic foam, considering buying some more now. They look great and totally pimped out my studio with them. Very well made. No inconsistencies, which is good because I had a very strict size to work to. 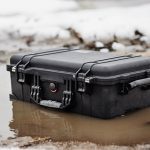 Love the SoundFix range! Bought a few of these now and they have done wonders for my recordings. Superb results from initial installation. The price I paid was better than other websites I looked for acoustic foam on. Comapred to other places on the Internet and the these came out on top in terms of price and quality. I'd say I might the right decision. Cheapest place I could find online but the quality doesn't reflect that. Very, very happy with these. Perfect for my current project. Time was of the essence so the fast delivery here made the decision for me. Thanks guys! Much better than I expected to be honest considering the price. The tiles are well made and effective. Really well made. Cheaper than other places I searched online but clearly hasn't sacrificed quality. Arrived when the order stated. Huge thanks for your help on the phone. Would recommend your services to others. Arrived next day! Now to get them up on the wall. Converted the garage into a music room with your wall panels and bass traps. Looks good and the sound is much better now. Exactly what we needed for our attic room. We set it up as a home cinema and after spending quite a lot on a bose sound system thought we would invest in some of these to reduce the hollow echo noise we were getting from the natural acoustics up there. Worked a treat. Really good quality. Had them for a few months now in one project and they still look like new. Come back for a few more for another project. Exactly what I needed for my daughters music room. Paired it up with corner cubes and bass traps like the woman on the phone recommended. My daughter is happy with the difference they have made and has already recommended them to others on her course at University. Measured up my wall and they fit perfect. I used spray adhesive from B&Q. Awesome foam tiles, look good and great quality. Would recommend. These were perfect for my home studio. Recordings sound so much better now. Thanks again for all your help! These acoustic foam tiles are great. They've made a huge difference since I've installed them. Arrived fast and they were cheaper than other places I looked. Very happy with my purchase. Acoustic Foam, Found the entire purchase simple from web to collection. Staff were extremely efficient and very friendly.....i opened an account for any future purchases.